May 22, 2012 — AKVIS is glad to announce the update of 5 programs. All of these products are available in two variants: as plugins and as standalone applications, on Windows and Macintosh. Bugs have been fixed, and the plug-in versions are now compatible with Adobe Photoshop CS6. Registered users can upgrade to the newest versions for free. 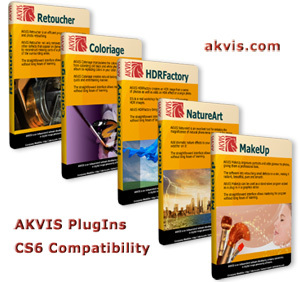 Five AKVIS image processing programs have been updated: Retoucher 5.5, Coloriage 8.5, HDRFactory 2.5, NatureArt 4.5, MakeUp 2.5. They can be used as plugins for image editors and as standalone applications, on Windows and Macintosh. This release is significant for plugins' users in the first place, so far as it offers a free compatibility update for Adobe Photoshop CS6. All plug-ins will also be compatible with the upcoming Photoshop Elements 11. As for the standalone versions, bugs have been fixed. You can see the details in the change lists of the programs. They are available on the Download pages (Windows, Mac OS X), as well as the fresh versions of the programs. AKVIS Retoucher is an efficient program for photo restoration and photo retouching. The software removes dust, scratches, stains, date stamps, odd details. It reconstructs the missing parts of the photo using the information of the surrounding areas. Download version 5.5 here. AKVIS Coloriage lets manipulating the colors of an image: from colorizing old black and white photos to replacing colors in your color photos. The software creates natural-looking colorization in a quick and entertaining manner. It works equally well for coloring of portraits, landscapes, fashion, and still life. The skin, sky, verdure, and tree color patterns help users to select realistic colors for their picture. Download version 8.5 here. AKVIS HDRFactory is a versatile program for creating High Dynamic Range images and making photo correction. The software creates HDR photos by combining several images of the same object taken with different exposure values. Also, the program can imitate the HDR effect on a single photo. It enlivens colors on an image. The new version adds support for GPU acceleration that significantly speeds up image processing. Download version 2.5 here. AKVIS NatureArt is an excellent tool for imitating the magnificence of natural phenomena on your digital photos. You can add some dramatic nature effects by putting the Sun or even a lightning bolt to it, by adding rain or snow. The program also creates nature scenes from scratch converting a blank background into a sea view or a night sky with scattered, glistening stars. Download version 4.5 here. AKVIS MakeUp improves portraits and adds glamour to photos, giving them a professional look. The software lets retouching small defects on a skin, making it radiant, beautiful, pure and smooth. It can also create high key photographs. Download version 2.5 here. Registered users can upgrade to the newest versions for free! These products can be purchased as separate products, downloadable from akvis.com, as well as in the software bundles. AKVIS offers to download and evaluate all features of the software during the 10-day trial period. Users who tried the previous versions of the programs and whose versions have expired now have an opportunity to test the software again.